This unusual plant is a close relative of the Asparagus Fern, but has a very delicate, soft appearance. It is valued for its use with floral arrangements. The Plumosa Fern is often confused with its cousin, the Asparagus Fern. Both are related to the common vegetable of the genus Asparagus. Unlike its edible relative it is toxic to pets, so it is best placed where it will not be a temptation. Conveniently, Plumosa has tiny, almost invisible thorns that deter animals from it, but it feels delicate and feathery to the touch. The Plumosa fern is not a true fern. It is a member of the family Liliaceae, the same family as lilies and garlic. Its genus and species are Asparagus setaceus. 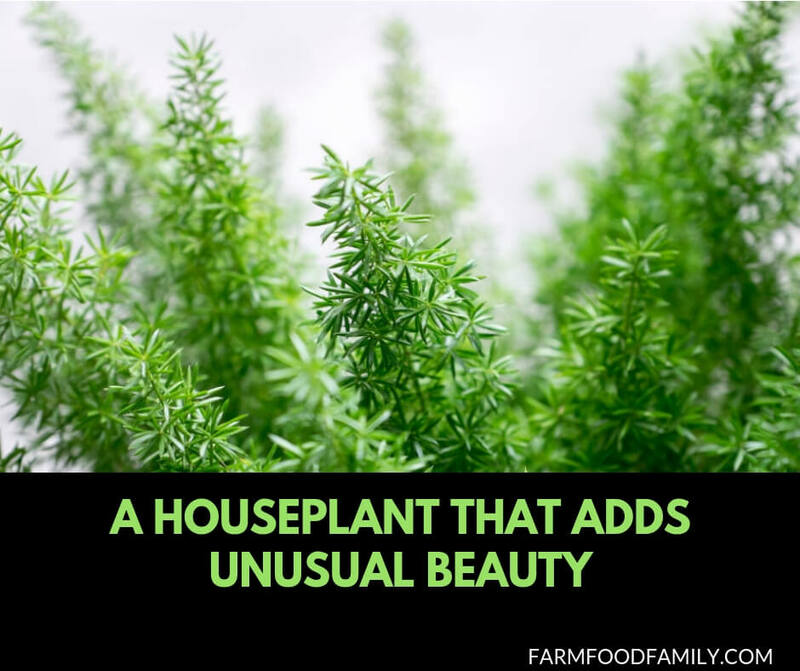 It is similar in appearance to the more common Asparagus densiflorus, but makes a more suitable houseplant being able to manage with less light. Plumosa Ferns thrive in high light conditions, but are adaptable to lower light, and can tolerate lower lighting conditions in the winter as long as they are kept in a brightly lit room and can receive an hour or so of sunlight daily. The rate of growth slows dramatically during the winter, but it can maintain a healthy presence with minimal care. Brighter light accelerates the growths dramatically. The tuberous root system requires a larger pot than might be expected. In a ten inch pot Plumosa can be happy for years and send out feathery stems 18 to 24 inches long. Unlike most true ferns, these plants grow best in drier soil. Overwatering will cause browning or yellowing of foliage. It is best to allow the soil to become almost completely dry before watering. Plumosa– even large ones– may require less water than other common house plants. The bulbous roots of Plumosa store nutrients and water, releasing them as needed. A monthly feeding of a common 20-20-20 plant food is sufficient during the growing months. Reduce feeding to every two months during the winter. Repotting should not be required frequently if a space is allowed for root growth. Plumosa will grow well outside in containers. Take care to avoid blazing sun or extremely hot temperatures and check water conditions more often. A bright spot with partial shade is best. Plumosa will not tolerate freezes well. The delicate greenery is perfect for cut flower arrangements. The stems are so popular that they are sold in bunches for a good price. Keep the water in the vase fresh by replacing it every three days with cold water and trim about a half-inch off the bottoms of the stems to help the stems absorb water. Add a commercial floral preservative for longest life of perhaps ten days. The Plumosa Fern is not a true fern, but a member of the asparagus family. Its feathery stems make it valued as a delicate enhancement for floral arrangements. It is a low maintenance plant which will survive winters in a brightly lit room. It can be grown outside in partial shade. Care should be taken to keep it away from children and animals, as it is toxic if eaten.